In September 1943, he entered the diocesan seminary of Holy Cross College, Clonliffe, and began his studies at University College Dublin. It was the beginning of a brilliant academic career, with first class honours in his BA degree in 1946. The following year he completed his Masters degree and was awarded the National University travelling studentship in Philosophy. Between 1947 and 1951, Desmond Connell studied theology at St Patrick’s College, Maynooth where he led the BD class. He was awarded a Bachelor of Divinity degree. Following his ordination by Archbishop John Charles McQuaid on 19 May 1951, he took up his travelling studentship and spent two years at the Institut Supérieur de Philosophie in Louvain. There, in 1953, he was awarded a PhD “avec la plus grande distinction” for his dissertation on the Vision of God in Malebranche. That same year, Dr Desmond Connell joined the UCD Department of Metaphysics in Earlsfort Terrace. For the next 35 years, his life was centred on UCD. He was appointed Professor of General Metaphysics in May 1972 and later Dean of the Faculty of Philosophy. Dr Connell successfully pursued his research interests and in 1967 published his major work The Vision in God – Malebranche’s Scholastic Sources, still recognised internationally as an important study on the philosopher. In 1981, he was awarded a D. Litt by the National University of Ireland for his published works in philosophy. He was a member of the Irish Hierarchy’s theological commission and the Diocesan Committee on Ecumenism. He was named a prelate of Honour of His Holiness in 1984. He was initially a chaplain to a Poor Clare community and later to Carmelite communities at Hampton and Blackrock for many years. 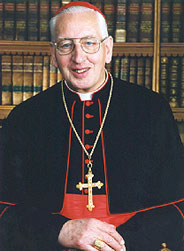 In succession to Kevin McNamara Desmond Connell was appointed Archbishop of Dublin by the Holy See on 21 January 1988. He chose as his episcopal motto, Secundum Verbum Tuum (According to Thy Word) citing Luke 1:38. He was consecrated by Gaetano Alibrandi, Nuncio in Ireland, in the Pro-Cathedral, Dublin on 6 March 1988. 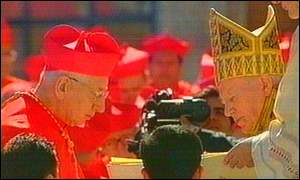 He was created Cardinal by Pope John Paul II at the Consistory in Rome on 21 February 2001 and named Cardinal-Priest of S. Silvestro in Capite. 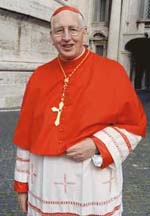 Desmond Connell was one of the cardinal electors who participated in the 2005 papal conclave that selected Pope Benedict XVI. He had previously served with the then Cardinal Ratzinger as a member of various Vatican commissions and Congregations. Among the Congregations and Commissions on which Desmond Connell served are the Congregation for the Doctrine of the Faith and the Congregation of Bishops, the Pontifical Council of the Laity and the Pontifical Council for the Pastoral care of Migrants. Cardinal Connell has published a number of works on philosophical and pastoral issues. Desmond Connell is a man of prayer, principle, courtesy, integrity and commitment to his faith and Church. During his episcopacy he faced many challenges arising from the repeated revelations of clerical sexual abuse of children. 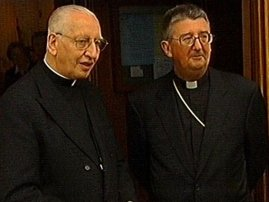 In the wake of these revelations Archbishop Connell established a child protection agency in the archdiocese and his decisions in this difficult area were guided by the advice of that agency. A spiritual man, at the heart of his pastoral ministry as priest, philosopher and bishop was a knowledge and experience of the person of Christ. He successfully restructured the financial situation of the archdiocese during his time as archbishop. Desmond Connell was interested in and knowledgeable about, the arts. He had a great fondness for the works of Puccini and Verdi. He lists Mahler and Elgar among his favourite composers. He held a deep and passionate interest in history, in particular the French Revolution. As Archbishop Desmond Connell blessed and opened a number of Churches in the diocese including Ballygall and Rathcoole. He inaugurated a period of Eucharistic renewal in the diocese and promoted devotion to the Sacred Heart. He led the diocesan process at the beautification of the Irish martyrs. He oversaw a publication of the history of the archdiocese. Under his auspices, initial meetings with respect to the summoning of a diocesan synod took place. He inaugurated the Women’s Forum where female church issues could be aired. During his episcopacy Formal Linkage agreements were established between Dublin City University and both St. Patrick’s College of Education, Drumcondra and Mater Dei Institute of Education which enabled each of them to become a College of Dublin City University. 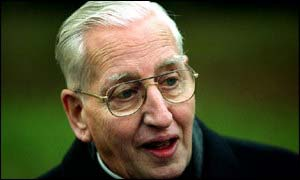 On 26 April 2004, Desmond Connell retired as archbishop, handing the diocese over to Archbishop Diarmuid Martin.